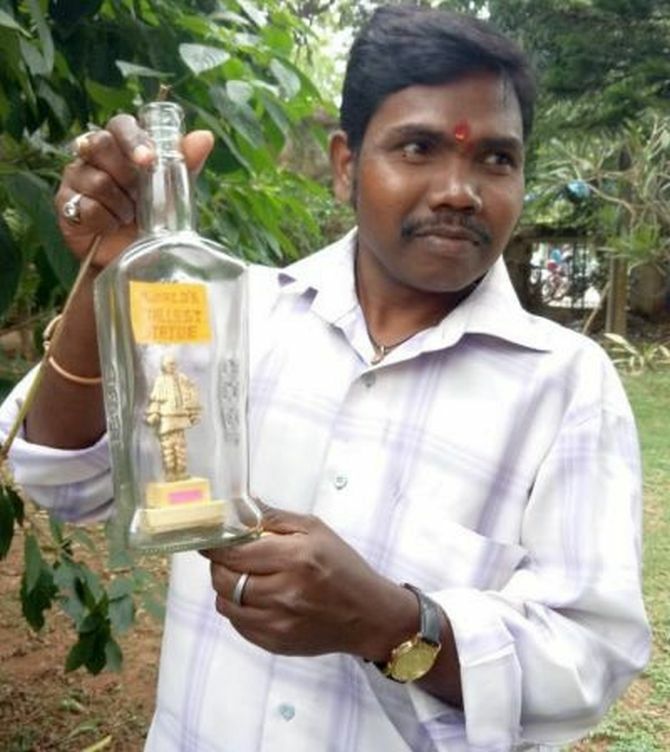 L Eswar Rao, an artist from Bhubaneswar in Odisha, has made a three-and-a-half inch miniature of Sardar Vallabhbhai Patel inside a bottle using soap on the occasion of the fourth Rashtriya Ekta Diwas (National Unity Day). “It took me three days to complete this miniature art in bottle with soap. I thought to wish the great freedom fighter Sardar Patel ji in my way on October 31,” Rao said. Rao has been practising miniature art since last 20 years. National Unity Day is observed every year on the birthday of Sardar Patel. Prime Minister Narendra Modi will inaugurate the Statue of Unity in Gujarat’s Kevadiya on the occasion of Sardar Patel’s 143rd birth anniversary. Located in Sadhu-BetIsland, Gujarat, the 182-metre long statue occupies over 20,000 square meters, and is surrounded by a 12 square km artificial lake.